After two Battery Park City bridges were destroyed during the terrorist attacks on 9/11, the city quickly built the Rector Street Bridge, a temporary solution to let pedestrians safely cross West Street. The state’s department of transportation released a proposal in 2006 to reconstruct the promenade but opted to renovate the bridge in 2009 instead. 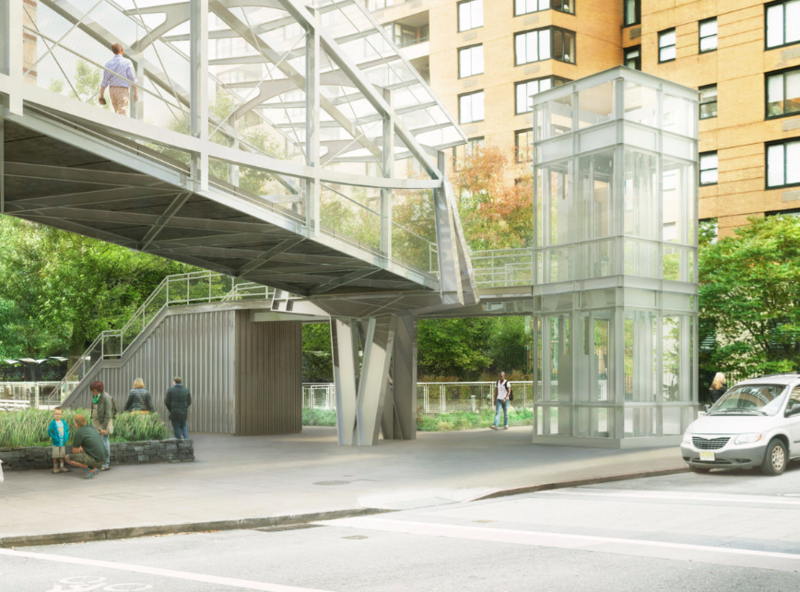 WXY Architecture released a new proposal in 2013 to replace the Rector Street Bridge with a 230-foot-long light-filled, permanent pedestrian walkway at West Thames Street. But, as Crain’s first reported, the project won’t meet its fall deadline and the project’s budget has grown from $20 million to roughly $40 million. The delay comes as Skanska, a construction management firm, replaced the fabrication company it hired to assemble the bridge. And Carl Rodrigues, a senior adviser to Deputy Mayor Alicia Glen, told Crain’s that a “weld defect” was discovered, possibly shortening the 75-year lifespan of the bridge. After construction kicked off in November 2016, officials said the bridge would be completed in 2018. 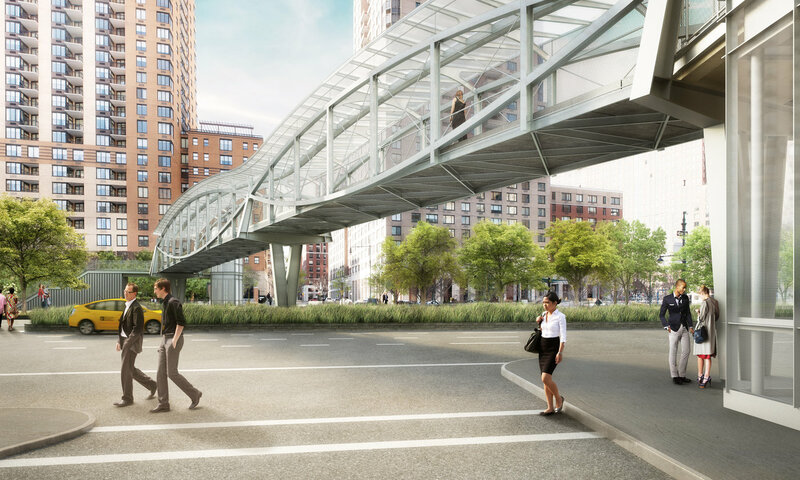 The bridge sits at the front of luxury condo 50 West Street to let residents travel between Battery Park City and FiDi. 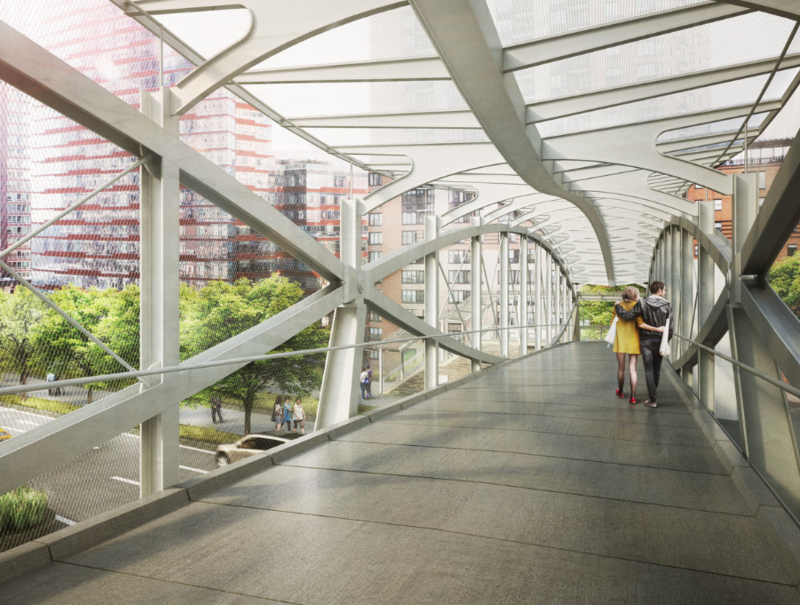 The design of the bridge, in collaboration with Thorton Tomasetti and WXY, includes a 12-foot wide walkway for pedestrians to easily cross as well as sight-see. The glass roof keeps the bridge filled with light during the day. According to the architects, the landings are designed to minimize the impacts to the community playground and gardens on the corner of West Thames and West Streets.